State Fair time – Twin City folks do not be alarmed if the deliveries are running a bit behind normal. 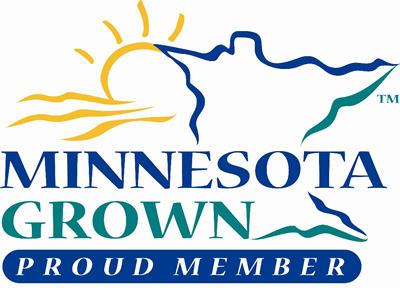 We will be at the Minnesota Grown booth on Saturday, September 1st from 1-5 PM – stop by and say hi if you are at the fair that day!!! 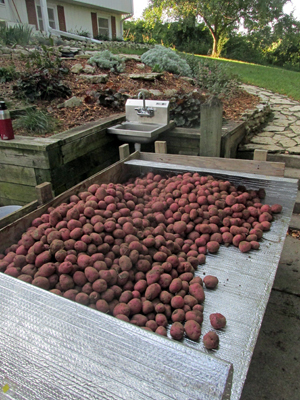 This is the beginning of many deliveries of potatoes – first Red Norland and later on Cascade baking potatoes. Full shares get a break from the prolific eggplants this week. Sage can be easily dried for winter use. Sweet corn returns in next week’s box. 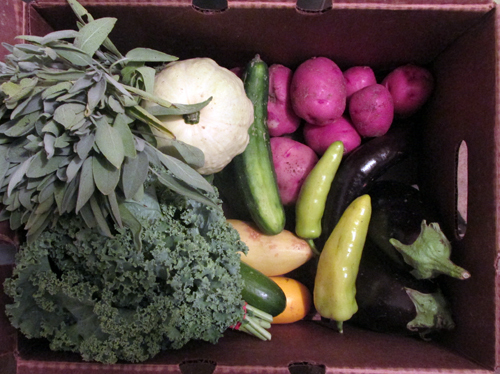 Purple beans and purple carrots will be in the next few boxes in honor of our Minnesota Vikings. The summer squashes and cucumbers are beginning to ease back. Still very little rain – the last 2 weeks we were able to squeeze out 2/10 of an inch each week. The basil is sure showing the signs of our cooler night temperatures and shortening of daylight. One of our bee colonies set a record as I added a 5th super box this week. We will be processing our 23 Red Ranger meat chickens this Saturday on the farm. Enjoy all of the bountiful produce this week – after you wash it! We hope all of you are having a fantastic summer … we are!! We planted tomatoes back in early April into a germination chamber that maintains a constant temperature of around 90 degrees. 5-7 days later the seeds had sprouted and were moved into the heated green house to slowly strengthen and grow. After a month they filled out their first cells and were potted up into 3- and 4-inch pots. They need circulating air, water, warmth, and lots of sunlight. 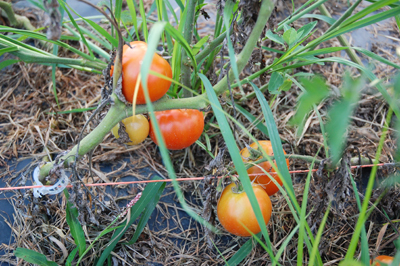 This year, April was very cold and bleak and the tomatoes grew longer and lankier than usual; we normally do not transplant tomatoes out into the field until there is no longer a threat of frost. We received 9 inches of rain from late May through June and we ended up planting the tomato starts into black plastic during a rainy part of this period. The tall plants were not strong and heavy rain and winds blew them over before we could get them trellised. This resulted in much of the crop picking up a blight that lives in the soil. This blight weakens the plant and shortens its lifespan. Needless to say we do not have a great tomato crop this season. We will continue to deliver what we have over the next few weeks. We do have 100 plants in our hoop house that have remained blight free. Next season we will make sure to trellis our tomatoes the same day that we plant them to minimize this blight issue. If you receive tomatoes this season that are not quite ripe just let them sit on the counter for a few days or inside of a paper bag until ripe. 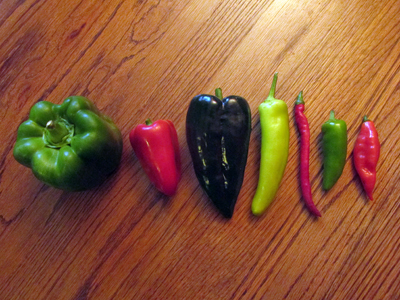 For the last full week of August, our featured crop is peppers. Here in Spring Valley, we are growing a whole host of different varieties ranging from spicy to sweet and including bells peppers, hot wax, and cayenne to name a few. In spite of their name, peppers have nothing to do with spice called pepper often used as seasoning, although early explorers may have been mistaken in thinking the fruit of the shrubby plant looked like the spice they were looking for. It is due to this 400-year old mistake that the name “pepper” has stuck. The European explorers who landed in what is now America were partly in search of spices similar to the ones found by Marco Polo a hundred years earlier in the Far East. Instead, they found the main crops used by the Native Americans of maize, potatoes, and tomatoes. They would have noted, though, that the Native Americans flavored their food with ground peppers, and since it was hot, like pepper, perhaps wishful thinking colored their objectivity. In any case, the explorers returned to Europe with the new vegetables, describing them as peppers and advertising them as more pungent than those from the Caucasus region. Peppers and chilies are both members of the Capsicum family. To distinguish between them, peppers are often called sweet peppers, bell peppers, and even bullnose peppers and come in a variety of colors – red, green, yellow, white, orange, and a dark purple-black. There a many ways to cook peppers. Sliced, they can be fried with onions and garlic in olive oil and then braised with tomatoes and herbs. This is the basic ratatouille; other vegetables, such a zucchini and eggplant, can also be added. Peppers can be roasted, either with ratatouille ingredients or with only onions and garlic. Cut the peppers into large pieces, place on a roasting pan, and sprinkle with olive oil, torn basil, and seasoning. Roast in an oven set at 425 degrees F for about 30 minutes, occasionally flipping them over. Broiled peppers are another great dish. Once broiled they can be skinned to reveal a soft, pleasant texture and added to salads. To skin your peppers, cut them into quarters lengthwise and broil, skin side up, until the skin is charred and evenly blistered. Place the pieces immediately into a plastic bag and close the top of the bag with a tie or loose knot. Leave for a few minutes and then remove the peppers from the bag and the skin will peel off easily.